Carrot cake has to be one of my favorite cake to eat and make…I just don’t make it as often because I would EAT the WHOLE cake all by myself. Usually during Easter Holiday is when I make it. Or when I have a lot of carrot left over and need to use them up LOL. 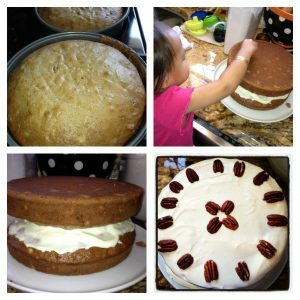 Carrot cake has to be one of the easiest cake to make…the only downfall is that it takes a lot of ingredients. Large bowl, beat eggs, oil, sugar (white and brown), vanilla extract, apple sauce, and butter. Once that is nicely incorporated. Mix in flour, baking soda, baking powder, salt, cinnamon, and nutmeg. Stir in carrots and fold in pecans. Pour into prepared pan and bake at 350 for 40-50 mins..or until the toothpick comes out clean. Let cake cool completely before you frost. For frosting…. combine all the ingredients together and mix until creamy. You can adjust according to taste….if you don’t like it to sweet..don’t add all the powdered sugar. The frosting is pretty sweet so use a little at a time when putting on cake. 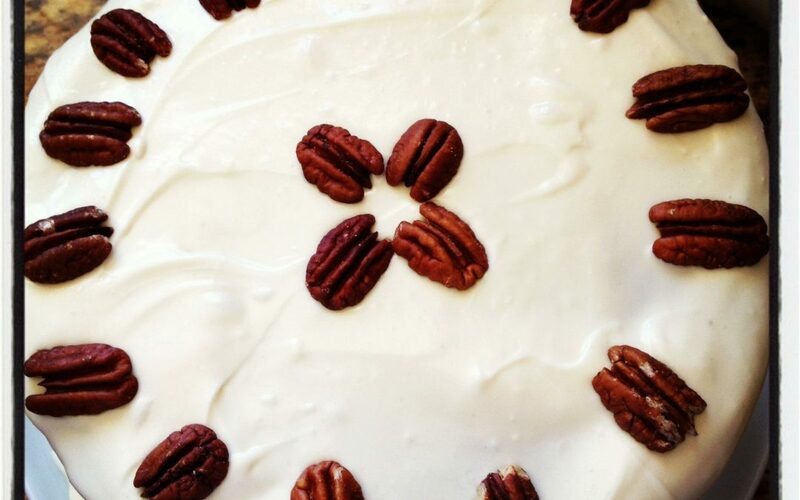 I used some pecan to decorate the cake. ENJOY!!! !